If you want to see, how in the US „the deep state“ is at work, how the US Power Elite is working via their „Intelligence“ structures with impunity against all constitutional and legal frames, you´ve got to read „Family of Secrets“ by Russ Baker (http://www.familyofsecrets.com/about-the-book/) on the assassination of Kennedy and on the Bush Clan. I´ve mentioned that book in some articles (http://tinyurl.com/9hxxkah & http://tinyurl.com/ndzt8ho) on this internet blog. The well researched book is a „must read“ if you want to look into the „power machine“ of the US. One might say, Kennedy´s assassination was half a century ago, so what? But believe it, the degeneration of morals in the really powerful inside the US has rather speeded up. In context with Kennedy´s assassination more murders took place, as for example the „patsy“ Oswald, but another one is also outstanding. Mary Pinchot Meyer, Kennedy´s most important extramarital „affair“, was murdered less than a year after her lover. Not only that she obviously had have a great influence on the President in turning him away from Cold War and its risks (which infuriated an important section of the US Power Elite), but she knew a lot about his adversaries and was infuriated about the gigantic „cover up“ represented by the „Warren Commission” and threatened to speak out in public. This was not to be! She was murdered on a walk, the deed was to be presented as a “deadly sexual assault” fixed to a helpless black “patsy”. By a brilliant African American lawyer, Dovey Johnson Roundtree, this attempt was smashed, the patsy acquitted without finding the true killer. But the case got also more delayed attention (beyond the fact that her affair had been written about a couple of years later). Someone also going deep into the case was Peter Janney. The best friend of one of her sons, who died age nine, and deeply impressed by his friend´s mother and her personality could not forget the case happening when he was a teenager. The later on clinical psychologist was indeed almost haunted by the terrible crime on his idol. With criminal cases and teams working on them usually people being involved with the victim or the evil doer are with good reasons excluded from the case. But (being dramaturgically at times exploited in criminal thrillers) a personal involvement can also deliver the obsession which is sometimes needed to take the pain and hardship to get on the bottom of overall complicated cases. Now he was not only a boyish admirer of his dead friend´s mother but also found out that his father – a high ranking CIA man as well as Mary´s ex husband likewise – were also strangely involved into the case. Mary Pinchot Meyer was a “society Lady”, being “one of them”, but “there are limits”. So obviously also to her former class mate James Angleton, high, high up in the CIA hierarchy thought. Janney invested an enormous energy and was surely also at risk with his researches to find most of the clues of the case. No doubt, the personal affection with Janney has affected his style of writing at times in a way which could be seen as negative in as far as he tends to idealize Mary Pinchot Meyer and her lover as well. Also some details coming from his affection lengthen the book making it more difficult for the reader (with time shortage) to follow, but it must be admitted, unlike in Kennedy´s case, who fascinated so many people, perhaps it needed exactly Janney´s personal involvement to put that much energy into the case of the far less prominent Mary Pinchot Meyer! 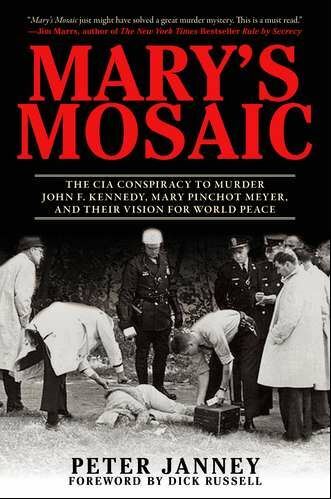 Anyway, Christmas ahead, buy the book (http://solari.com/blog/marys-mosaic/) for yourself and/or for politically interested relatives and friends! Read it, I guess you won´t regret! Thüringen: DIE LINKE führt die Landesregierung! Season´s Greetings and a Happy, Healthy & vigilant 2015!